In atmospheric boilers, fuel (oil or gas) is burned under atmospheric pressure. For oil, this results in an inhomogeneous fuel-air mix, varying flame temperatures and the formation of carbon monoxide (CO) and volatile organic compounds (VOCs) harmful to man and the environment. Unburned fuel adds to this. Atmospheric burning gas boilers, however, have very low emissions. They are still common because of their technical simplicity, high reliability and good fuel utilization ratios up to 90 per cent to 93 per cent. Capacities range down to as low as 5 kW. Oil-fuelled atmospheric boilers are not installed in state-of-the-art heating systems because of their high emissions of volatile organic compounds and CO.
A fan's supply of combustion air makes the system more flexible for part-load operation and operation under different meteorological pressures. The fan is typically installed at the air intake before the furnace. Installation in the flue gas is unusual because of material problems. 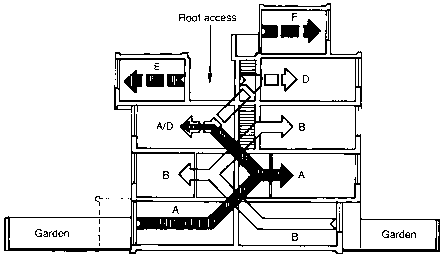 The fan may be positioned on the exhaust air side if the chimney does not draw sufficiently to overcome the pressure drop of a large heat exchanger (condensing boilers), catalysts, etc. Charged oil and gas-fuelled boilers have standardized fuel utilization ratios of 92 per cent to 95 per cent and are manufactured in capacities as low as 5 kW. Such boilers recover energy from condensing water vapour in the flue gas as one of the combustion products. This necessitates low temperatures in the heating system and larger heat exchanger surfaces. The latter increase the pressure drop over the heat exchanger, possibly making a repositioning of the fan necessary. The condensed water from a gas burner is slightly acid, but can be disposed of via the normal sewage system. In the case of oil boilers, sulphur dioxide (SO2) in the flue gas forms sulphurous acid (H2SO3), which needs to be neutralized before being discharged into the sewage system. Condensing boilers are more expensive than equivalent atmospheric boilers but are up to 10 per cent more efficient. This results from the highly standardized fuel utilization ratio of up to 109 per cent and 104 per cent (relative to the lower calorific value) for gas and oil boilers, respectively. System capacities are equivalent to atmospheric and charged boilers. Because high-performance houses can operate at low heat supply temperatures, condensing boilers are a good match. Ventilation systems with an efficient exhaust air heat recovery only need a small booster heater to provide sufficient heating power. Several solutions are available: heat pumps that extract heat from the exhaust air after the heat exchanger or solar thermal systems backed up by electric or fossil-fuelled furnaces. Natural and propane gas-fired condensing heaters can supply this backup today. Small and highly efficient oil boilers with low emissions are still under development. 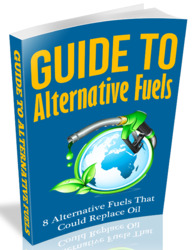 Several systems developed for fossil fuels have been adapted to burn renewable fuels, such as oil from sunflower seed. Centralized systems: due to the small heating demand and small peak capacity requirements, a small central heating plant supplying several rows of houses or blocks of apartments may be sensible. At this aggregated scale, higher investment cost systems, such as geothermal heat supply, may become feasible. Systems for high-performance housing have to be carefully sized, with care given to avoiding over-dimensioned systems. The very low amounts of heat required constrain how much can be justified in capital costs to buy and maintain the system. Fossil fuel combustion requires periodic emission checkups of the burner and flue. Meter reading and billing charges take on a disproportionate magnitude in high-performance houses. Producing the heat centrally and distributing it seems sensible; but the pipe network must also be amortized and the heat losses of the grid are large when compared to the small supply demand. For all of these reasons, heat pumps have been more popular for houses, which are highly insulated and have minimal heating demand, to date, than fossil fuel combustion systems as a backup heat source.